Australian Prime Minister Malcolm Turnbull says almost 5000 Australian businesses and companies are operating in Papua New Guinea. He said during a business breakfast in Port Moresby the two-way trade between the two countries was valued at A$5.8 billion (K13.7 billion). 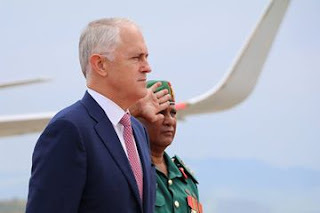 “We are glad to discover that there are some fine coffee left in PNG, despite the fact that you have exported the record volume of New Guinea Arabica to the baristas and kitchens of Australia in 2016,” Turnbull said. “But also our investment in Papua New Guinea – A$18 billion (K42.5 billion) – is more than Australia’s total investment in Indonesia, for example. “And that says a lot about the level of commitment to Papua New Guinea. “It involves so many industries and sectors particularly gold mining, oil and gas. “It contributes to PNG’s economic growth and employment, directly benefits the quality of life here. “A great example of this is Origin Energy’s programme to provide solar panels to homes. “Our investments in infrastructure, health, education, promoting and empowering women and girls, law and justice, governance, throughout our development cooperation and partnerships in private sector, all by supporting the PNG government to build strong foundations for economic growth.